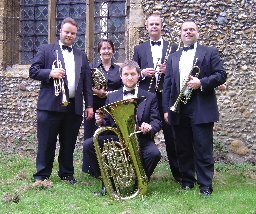 Based in Cambridge, UK, Something Brass is an orchestral brass quintet featuring five of the top players in the area. With over 100 years' playing experience between them, they have entertained audiences at home and abroad, with many different genres. They are no strangers to recording studios either, notching up many albums between them. Since joining forces in June 2002, they have worked hard to build up a large and varied repertoire with which to knock out audiences. You have been warned! Check out their calendar for events near you or contact them for details of how to book your own private performance!